Nestle India's popular noodle brand, Maggi, landed in a soup when it was found containing lead many times more than the pemissible limits in tests conducted across various states. It was also found to contain the controversial flavouring agent, monosodium glutamate (MSG), while the package didnt mention it. There was a lot of chatter about this in mainstream media and social media as it was people's favourite noodle brand. For a change the state governments acted swiftly and banned Maggi (and other brands with similar problems) from shelves finding them "unsafe and hazardous" for human life. Though Maggi initially played blind to these and claimed that its products are safe, it finally recalled the products from retail shelves after it got banned in many states and saw consumers loosing trust in the brand. This is the amongst the biggest problems faced by an established FMCG company in India, where most comapnies frequently flout rules in collusion with the system and dont get fined or penalised for it (as will most probably happen with Nestle too). This is a larger crisis than Cadbury worms (found in one store) or the pesticide cola issues (found once and then seemingly withheld), moreso because Maggi advertisies itself as a healthy nutritous brand that moms can safely give even to their young children. Maggi accounts for around 25% of Nestle India’s revenue and 20% of its operating profits. So its important for Nestle to regain consumers trust in its product. One thing that is surely going for them is the love that many Indians have for Maggi, the instant food brand that saved them in times they would have otherwise slept empty stomach and a brand that brought a change in their everyday palates without much effort. Add to this the stories around Maggi of hostel friendship, childhood fights, midnight pangs and so on, an observation used by the brand to come out with its not so successfull 'me and meri maggi' campaign, there is a lot of sympathy for the brand. Along with lobbying (aka bribing officials) to ease entry of Maggi back on shelves. We will look at possible executions of the PR campaign. This might be planned by the firm or not. But it sure seems to be helping it out. And if it was planned, hats of to the team to follow the usual startegies to achieve usual results, short term memory loss and regained confidence. Else they should thank their stars for such a reaction to the news of their misdeeds. 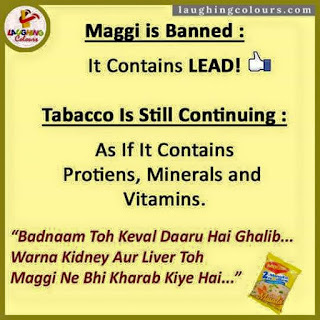 "Maggi is banned as it contains lead but sale of tobacco, still continues as if it contains proteins, minerals and vitamins"
"Ensure that water flowing out of every municipal tap is potable, so that millions of children don’t suffer from diarrhea every year." "Fruits reaching the market are chemically ripened; vegetables are laden with chemical pesticides and fertilizers" And we go after Maggi. 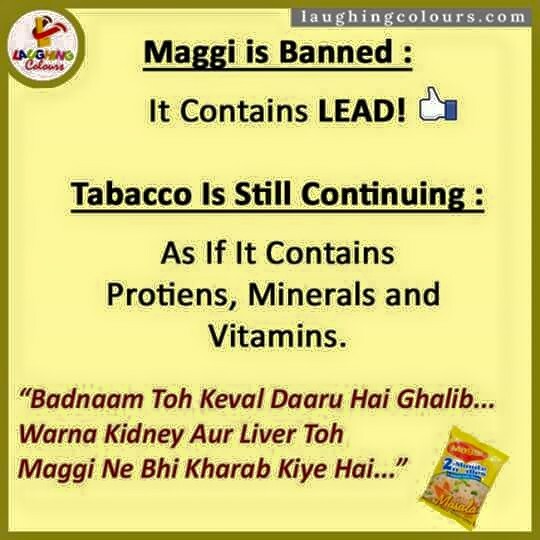 All leading up to the point that ills in India are larger than lead and MSG in Maggi. So the government should not call a wrong a wrong till all other ills are resolved. When India can live with all these why cant it agree to substandard research and production by Nestle Maggi. 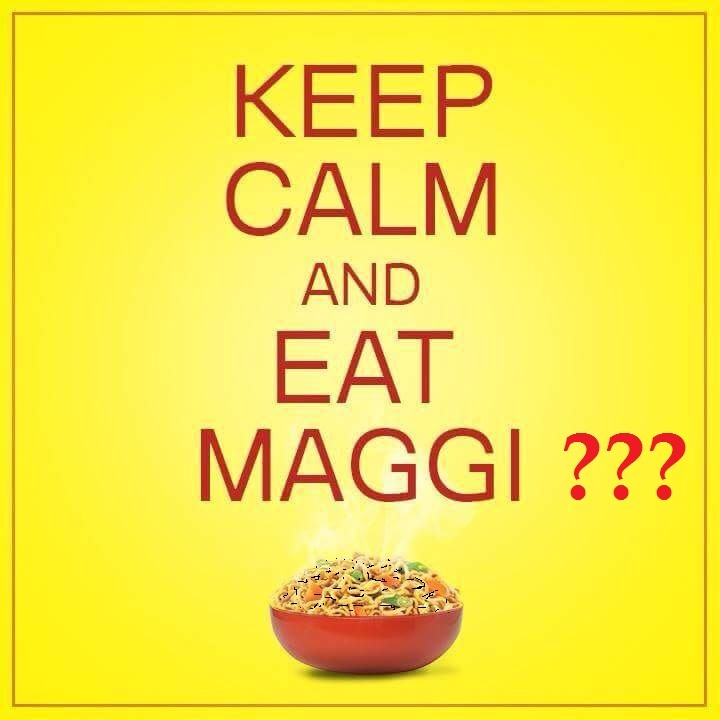 Maggi jokes: Start a trend, people will ape, rather improvise. 'The amount of maggi we have eaten, if it really contained that much lead, then the men would be natraj hb pencils by now and ladies would have turned to apsaras." Few jokes have gone against Maggi too. So it might not really be their doing. But the fun around these jokes kept at bay the discussion around the real issue of why a large multi national company like Nestle produced an unsafe product for years putting at risk the health of it consumers. This is a consipary against it by the local brands/ government. In an article published in TOI, V Raghunathan says "And yes, why are they always the “foreign companies” that are usually at the receiving end of our spasmodic angst of health standards? Could it be because targeting the domestic companies do not yield the same number of eye-balls as targeting a Coca-Cola or a Nestle or a Volvo? Is that also why now sights are being gleefully turned on Kellogs, Complan as well?" Even if this was so, it wouldnt have materialised if the product in itself didnt have these problems. Santosh Desai in his column in TOI says "For one, it becomes clear that for all the talk of creating an environment conducive for business, there exists in the state and in a significant part of the Indian public, a deep mistrust of corporations." I wonder why wouldnt it be so. Most within and outside these organisations know how companies work to squeeze every rupee possible even if it against the benefit of consumers, employees and society at large. A look at how many underpaid contract employees are involved in manufacturing Maggi tells us how concerned or inclusive Nestle's growth is and whom it benefits. And we went off the topic of unsafe Maggi again. But lets not ask why Neslte does not use a proper filtration procedure to avoid it. 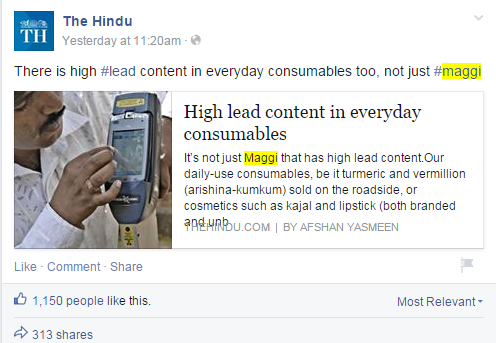 - Lead gets ingested in our systems from many other sources than Maggi. So its not just #Maggi. Fine lets not question Maggi too. - Does India have proper testing facilities? Why do countries like Singapore remove ban on Maggi imports. They are more developed and so if they are OK, sub standard Indian citizens must follow. Different batches of Maggi tested in different cities were found to have these problems. The manufacturing process for exports might be much more stringent than those for domestic markets leading to Singapore finding it alright. Or it could be different batches of production manufactured in different facilities. 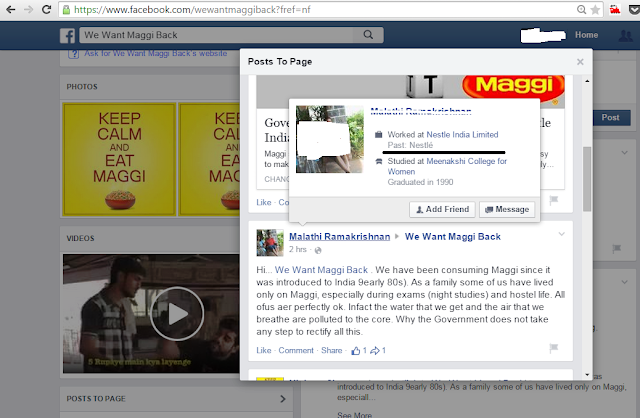 So I feel that it will be better to question Maggi than question Indian facilities. Ofcourse they should be questioned on why this was taken up so late and how are these companies being punished for these acts. 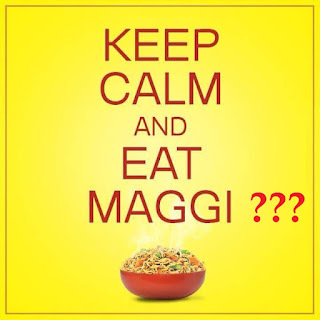 Whatever all this discussion makes Maggi a lesser culprit, if at all. 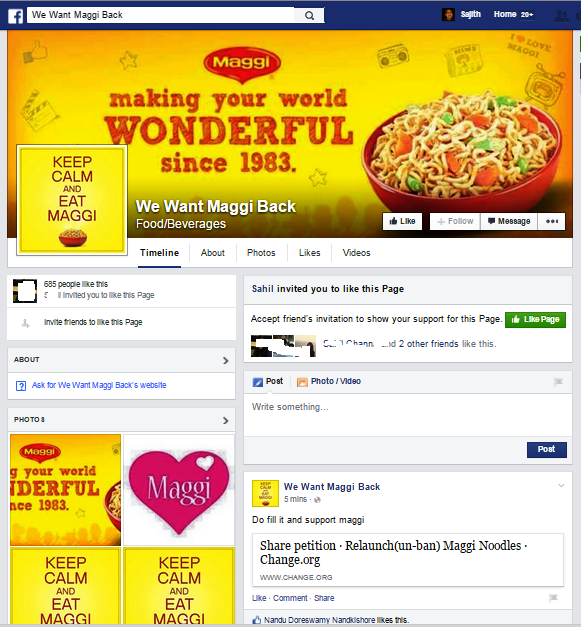 - Start a Facebook page to get people to raise their voices for suspending the ban on Maggi. Its another matter that most of the people who like it and are sharing posts on it are employees of Nestle as shown in their own profiles in about and cover pages praising Maggi. - Start a Cause, raise a petition, make some noise against the govt in support for Nestle. Again done by employees of Nestle. It seems like that they have been given a loyalty test through this PR campaign. When people like V Raghunathan say " Be honest. Is your child more likely to be ill ingesting a portion of the Nestle’s noodles or eating on the road-side stall, which operates with virtually no sanctions of the civic bodies?" 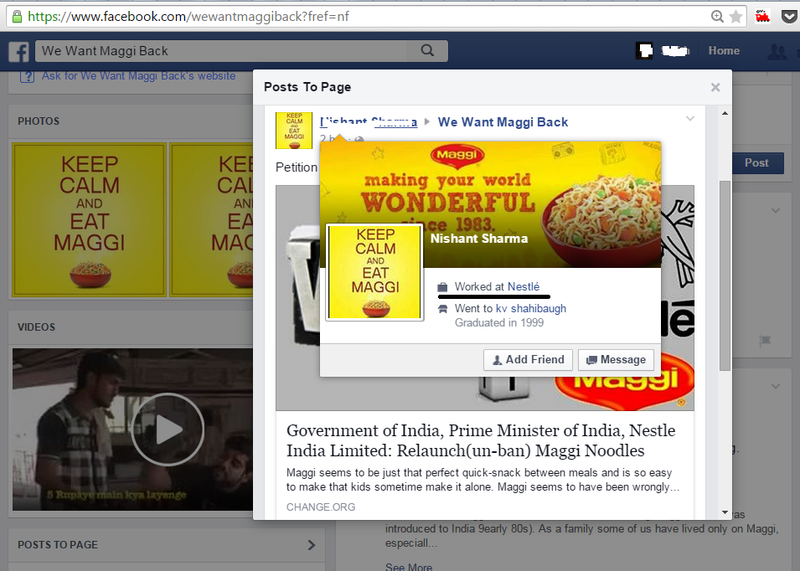 on this issue, then Maggi surely seems to be winning over. All this successfully changes the direction of discussion away from how a big multinational company like Nestle can produce such unsafe products and not follow proper packaging norms. This followed with a bit of silence about Maggi's health benefits, lobbying and large ad campaign will have Maggi back in our shelves soon. More than 2,100 import batches of 'made in India' products across food, personal care and health supplement categories rejected by the US food and drug regulator in the past one year. Most of the products were by leading companies such as Hindustan Unilever, Britannia, Nestle India, Haldiram, Heinz India and MTR Foods. Maggi Effect? 172 Out Of 733 Blood Samples Test Positive For Lead Poisoning. Lead exposure is estimated to account for 1, 43,000 deaths per year with the highest burden in developing regions. And what the sources for ideas / views or opinions presented in this write-up? Who is the author, in case these are individual assertions? I could not locate the references or source(s)! Most data like Maggi issue, contract workers, etc. are from pulled newspaper articles. Will hyperlink it.